There’s been a ton of buzz around Tempest, the first book in a new time-travel trilogy by Julie Cross. The book doesn’t come out until January 17, 2012, but the film rights have already been sold and it’s a series that a lot of readers already seem to be raving over. My reaction was a little complicated (you can read my full review here), but it’s a book that I do think is going to be very popular. The good people over at St. Martin’s Press were nice enough to send me an ARC to review, and I’d love to share it with my fellow bloggers! 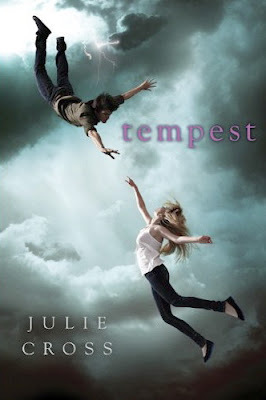 If you’d like to participate in the ARC blog tour for Tempest, please sign up here. Basically you’ll have one week to read the book before mailing it off to the next participant with delivery confirmation, and the only requirements are that you write a review (for your blog and/or GoodReads) and link back to this post. That’s it! I’d love to hear what everyone thinks, so I look forward to sharing the book with you. Please note that space on this tour is limited and registration closes at the end of the month, so sign up now if you’re interested! Wonderful reviews as always, love the site. I haven’t read Ruby Red, Maya, so I’m afraid I can’ answer that! :) Maybe someone else will weigh in.